How to Call Cambodia from the U.S. Sometimes when you want to call Cambodia, you don’t have the time to run down a mental laundry list of calling rules and codes. So if you want to make calling Cambodia a more pleasurable, less stressful experience, grab a peek at our “How to Call Cambodia” guide below. Next dial 855, the Cambodia country code. Then dial the 2-digit area code, followed by the 6-digit phone number. Need more help with how to call Cambodia? International calling isn’t blocked on your cell phone. Some cells are preset not to allow international calling, so you may need to undo this in settings. The cell number being dialed is supposed to have an area code. Many international numbers for cell phones won’t need an area code. You’re using a “trunk” code properly. A trunk code, or the zero you see occasionally listed as the starting digit of a cell phone number, is only used if you're calling within a few nations. Chances are you won't need it. So go ahead and drop the 0. Send a care package to your most beloved in Cambodia! Join Vonage World Plus 1000® and you'll receive our amazing VoIP server, the Vonage Box™ - which you'll be shipped for free (resident of the U.S. only). The equipment and box activation are both free as well. You'll get unlimited¹ landline and cell phone calls to Cambodia up to 1000 minutes a month, and after that it's only $0.07/minute. Call Cambodia cheap with Vonage today! You can also sign up your relatives or friends back in Cambodia with Vonage and give them the chance to call you. When you get the Vonage Box² (our VoIP server) in the mail, you ship it off to whomever you'd like to call you most, and from then on they'll share a U.S. area code with you - the same one you already have! That means you can call Cambodia from USA or they can call you from Cambodia with equal ease! Plus they'll be able to call anyone else in the U.S. just as easily. Wait wait wait, what about international calling apps? We've got you covered there as well. 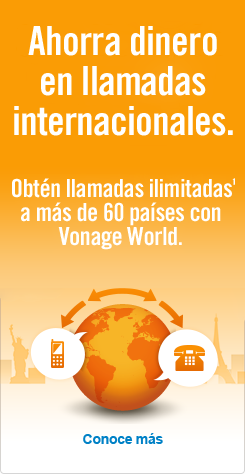 With Vonage Mobile®. It's our international aplicación de llamadas para Android™ and iPhone® devices that lets you talk for free from anywhere to anywhere for as long as you want. It’s what you might call a masterpiece of free calling. Check it out today!